1.83 metres (6 feet) lightweight aluminium flagpole complete with angled wall bracket, fittings and gold ball cap. + Lightweight aluminium flagpole complete with angled wall bracket, fittings and gold ball cap. + Measures 1.83 metres (6 feet) when fully assembled. 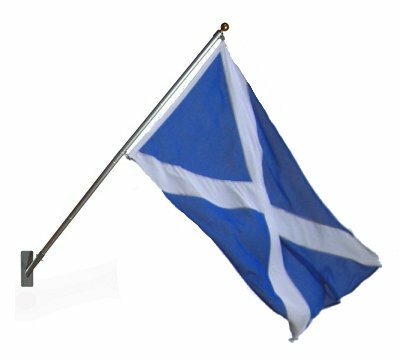 + Fitted with an anti-furl device which helps to prevent the flag from wrapping around the pole. + 180 degree fully adjustable wall fixing. + Recommended flag sizes 150x90cm (5'x3') or 140x70cm (4'6''x2'3"). + Please note price is for flagpole only (flag not included).